Nick Jr presents an all-new musical spectacular featuring all your favorite characters from Bubble Guppies, PAW Patrol, Dora the Explorer, Shimmer and Shine, Blue's Clues & You!, Blaze and the Monster Machines and Top Wing with Nick Jr. Live! Move to the Music! 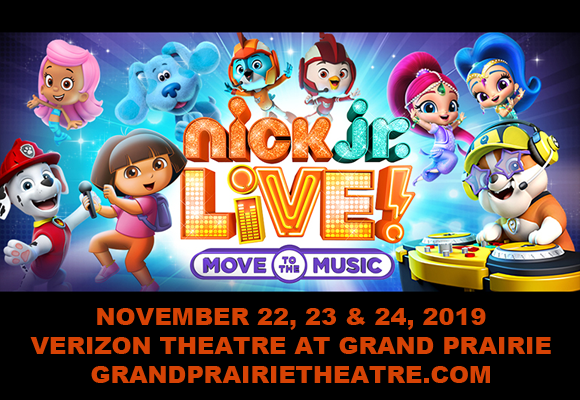 A bouncy celebration of all things Nick Jr., featuring music numbers that everyone can sing and dance along to, Move to the Music comes to Verizon Theatre at Grand Prairie on Saturday 23rd November 2019! Featuring a lively cast of beloved characters from everyone's favorite Nickelodeon pre-schooler shows, Nick Jr. Live! "Move to the Music" is a colorful and unforgettable event, perfect for your little one's first ever show! An enthralling musical spectacular, "Move to the Music" sees members of Bubble Guppies, PAW Patrol, Dora the Explorer, Shimmer and Shine, Blue's Clues & You!, Blaze and the Monster Machines and Top Wing in a one-of-a-kind song-filled production that's fun for the whole family! There will be live appearances, special on-screen guests and audience participation, so everyone can sing, dance, clap and cheer along too!